1955 Flowerfield catalog notes "KOKI NO IRO. 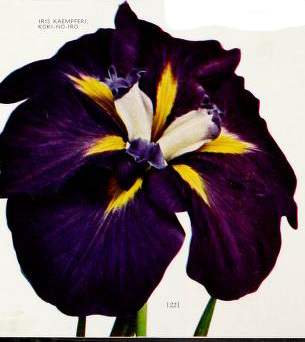 Rich royal purple; a double flower of enormous size with large white styles tipped with purple, often accessory style branches are large enough to form another row of petals, making it triple form. Tall and imposing, it is a splendid companion plant to Betty F. Holmes as it blooms at the same time. Each $1.50, Three $4.25"
Please help us record more characteristics of this Iris by adding comments in the Comment Box below; Note your location and date; Often characters such as height, flower size, purple based foliage, etc. are affected by climate and weather.